Billed as Hawaii’s only revolving restaurant, the Top of Waikiki delivers breath-taking views with food to match. We were able to have our meal and enjoy the sunset from our table, which rotated with the floor to get us front and center for nature’s show in paradise. We started our meal with goat cheese rangoons. These five pockets of bliss explode in your mouth, so heed well the warning. They are hot.Of course, if you’re like me, you won’t worry about the warning. They are great plain, and the five-spice dipping sauce adds another element to them. The ginger pesto crusted monchong was the hit of the evening. Firm, well cooked and flavorful, the fish did not disappoint. It was beautifully presented atop a bed of vegetables, and we added wasabi mashed potatoes to the order. Believe me, those mashed potatoes were amazing. 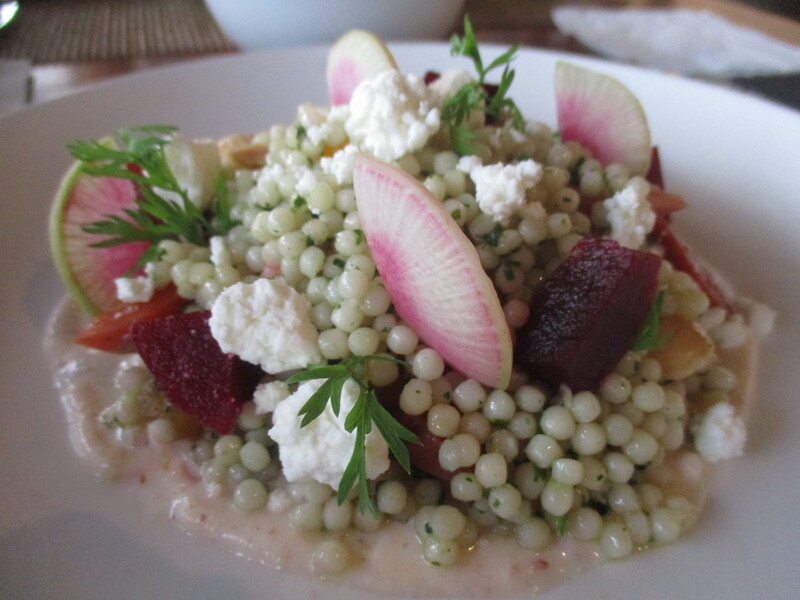 The pickled beet and carrot couscous was beautiful to look at. However, it was served cold and the pearl-sized couscous was chewy. There were a lot of textures, and a few of the bites revealed a deft touch in playing with spices. The almonds made the dish better. The baked Alaska delivered cold beneath a fluff of meringue. Strawberry sorbet with cake and cream made for a delicious ending. However, it was the coffee that delivered the final flavor for the evening and it was delicious. Previous post: Is the 3-Day Go Oahu Card Worth It? Next post: Two more days for Salem Holiday Market!